Starting a business in Northern Ireland – Here’s our Branding Tips! We’ve helped lots of startup companies in Northern Ireland, in ever conceivable industry. There are many things to consider when setting up a company – and one of the most important elements is your brand. It’s fair to say that there are a lot of different ways a brand can work – and it’s actually an ever evolving thing. However, there are a lot of considerations for branding in the initial stages. Here’s our top brand considerations that local Northern Ireland start-ups should be thinking about – which will hopefully make the process of brand development just a little bit smoother, something that’s very important when starting out. One thing that you really need to build a brand is a good awareness of your competition. If you can accurately assess your competition, you can more easily create a reputable and definable brand – because you have a basis from which to differentiate your business. Image – If you see that your competitors all have a similar kind of image or colour scheme, try to differentiate them in a visual sense. This can help you to stand out from the crowd. Message – Messaging is a key way to differentiate your business from others. A unique tone of voice can really change the perception of your brand and make it unique. Values – Try to think what the values of your own business are in comparison to others. If your competitors are ‘Flexible’, ‘Reliable’ and ‘Decisive’ as a business then maybe try to find different or bolder values to help you stand out. Rather than just seeing them as a threat, your competitors can be a source of inspiration to help guide your brand progression. There is no point in creating a brand that’s not distinct in some way – so make sure you do your research. If you’re starting a business you hopefully have something that makes your company unique and better, or just different, than others in your sector. As a result, you might want to try and define your unique selling point and build your brand around that. This is a great way to find a unique point of view. Services – Is there some aspect of your service that is unusual or otherwise unique? If so, shout about it in your brand! For example, are you a law firm that specialises in a certain practice most don’t? If so, shout about it and make yourself stand out. Pricing – If you have figured out a cheaper way to deliver a quality service, you could build your brand around this. If you’ve developed a tech solution you could easily share that with customers to position yourself more uniquely in your market. Proposition – A business proposition is the explanation of the benefit you give your customers or clients, and how you’re the better company over others. Define what you do in a simple way to make your brand pop. Positioning yourself as a unique force is the most important part of defining a brand that stands out – so make sure you make the effort to discover or develop your USP – and incorporate it into your brand. Are you providing excellent customer service? Customer service is a very important aspect of brand, as service dramatically affects the reputation of your company. Brand is not just about image – it’s about providing a great product that is associated with the brand – and support is an aspect of your products that you really need to consider. There are plenty of different types of product – but so long as you support the needs of your customers you can very much enhance your brand for a much more complete brand image. If you’ve got a competitor that is providing better service, you should seek to match that so your brand becomes intertwined with that sense of reputation and caring. People love it when you care about their needs in business, many people will forgive the occasional mistake or error so long as it is dealt with promptly and correctly. The logo or brand will evolve over time, but it is important to get it right first time round. This way it can stand the test of time and evolve gradually. Why first time? Think of the investment, only to not get it right. The effort and time lost from getting poor advice, and a logo design that doesn’t connect with your target audience, maybe even resulting in a loss of business. That’s where a company like ours comes in, honest advice and a fair price, can get a start-up a professional established look straight away. A professional image is more likely to result in business and give you confidence in promoting the business going forward. When you put together a business it’s a constant state of building. You’re always making a progression towards a business goal, and it’s understandable that your brand will change or develop as time goes on, but getting it right first time will save you time, effort and money, and hiring a professional design agency will benefit your business in the long term. 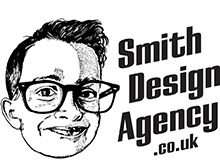 Get noticed in Northern Ireland with Smith Design Agency!